The reports that Iran launched a monkey into space Monday has sparked concern among U.S. officials and missile watchdog groups who cite that the same technology could be used to extend the reach of Iran's military weapons. 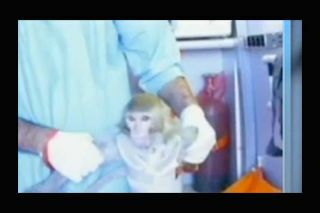 According to Iranian news reports, the country's space agency launched a monkey into space and returned it to Earth in a mission using the Iranian-built Kavoshgar 5 rocket. The launch, while unconfirmed by Western monitoring groups, has raised eyebrows because the rockets developed for such missions could also be used to fire weapons across continents. "We don't have any way to confirm this one way or the other with regard to the primate," U.S. State Department spokeswoman Victoria Nuland said during a press briefing in Washington Monday (Jan. 28), though she added that she "saw the pictures of the poor little monkey preparing to go to space." However, some scientist have said that the details so far on the Iranian rocket launch suggest the flight would do little to enhance the Islamic republic's ability to develop a long-range ballistic missile. Though the Islamic republic has denied military ambitions for its space program, Western critics have long expressed concern over the potential applications of Iran's rockets. Nuland said the launch, if confirmed, would violate a 1929 U.N. Security Council resolution that "prohibits Iran from undertaking any act related to ballistic missiles capable of delivering nuclear weapons." The Union of Concerned Scientists (UCS) said the launch, if it occurred, likely used a Kavoshgar rocket, which would do little to advance Iran's missile capabilities. Laura Grego, a senior scientist with UCS, wrote in a blog post that "some concern has been expressed that Iran will improve its abilities to produce heat shielding (important both for protecting a monkey and a warhead as they return through the atmosphere)." But a biocapsule returning from a 75-mile (120 kilometers) altitude, such as Iran's monkey-carrying Pishgam capsule, would travel through the atmosphere significantly slower than an intercontinental ballistic missile, or ICBM. According to Grego, "a warhead would require shielding against more than 40 times greater heat load than the Pishgam." Iran has reported progress in spaceflight technology in recent years. The country sent its first domestically built satellite into space in February 2009 and launched a Kavoshagar-3 rocket in 2010 that delivered a rat, two turtles and a worm into space. Iran also launched Earth-observing satellites into orbit in 2011 and 2012. Space officials in the country have said that a successful launch of a monkey would pave the way for them to send a human into space by 2020 and put an astronaut on the moon by 2025.